For programming practice, I created a chess program in PHP (my most comfortable language). 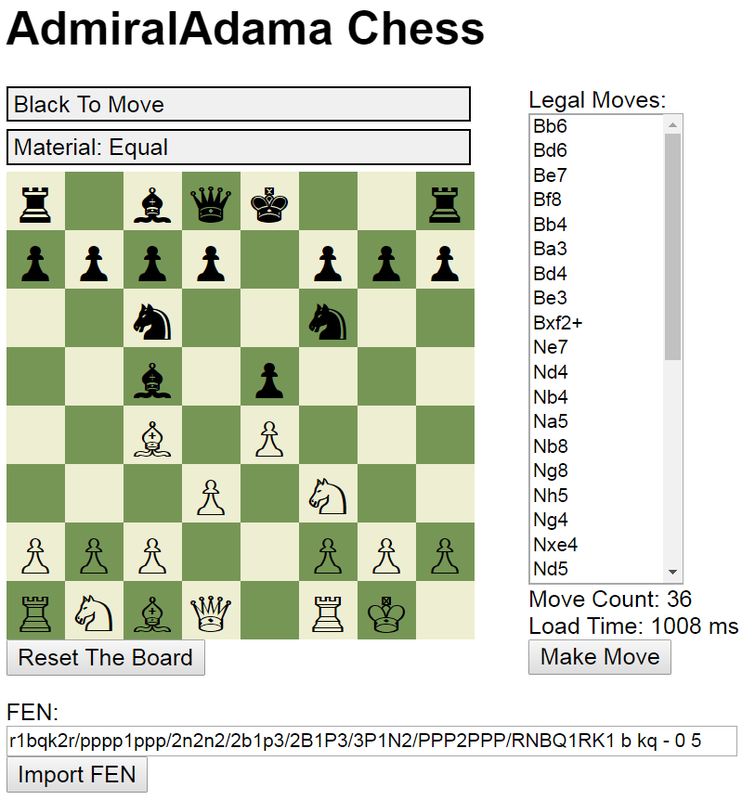 The program reads a FEN (a string with the location of all the pieces on the board) from the URL, generates a board, then generates all the legal moves for that position. Then when you click the move, it loads the same file but with a new ?fen= in the URL. The legal moves list code is 100% complete. It handles all special cases, including pawn promotion, en passant, castling, not allowing moves that place/keep your own king in check, etc. Moves can be made by double clicking on the move, hitting "Make A Move", or drag and dropping a piece on the board. PHP Refactoring - Make the PHP code more readable / more organized / use classes better. Humble beginnings: Version 1 of the program can be found here. // Skip this conditional. ChessGame's FEN is the default, new game FEN and doesn't need to be set again. // TODO: Is player to move checkmated? // If so, return NULL since there are no legal moves. The game is over! // Else you will get a weird list of legal moves including moves capturing the enemy king. // Set $king here so castling function can use it later. // XY coordinates and rank/file are different. Need to convert. // Make sure the rook is still there. This case should only occur in damaged FENs. If the rook isn't there, throw an invalid FEN exception (to prevent a clone error later on). // The ChessMove class handles displaying castling notation, taking castling privileges out of the FEN, and moving the rook into the right place on the board. No need to do anything extra here. // We basically need to flip X and Y to fix it. // Used to generate en passant squares. // These cases are rare. The data is passed in via set functions instead of in the constructor. // Do a deep clone. Needed for pawn promotion. // Automatically pick queen when drag and dropping. // Basic format check. This won't catch everything, but it will catch a lot of stuff. // TODO: Make this stricter so that it catches everything. // Set all board squares to NULL. That way we don't have to blank them in the loop below. We can just overwrite the NULL with a piece. // Match string = 1, but rank = 8. Fix it here to avoid headaches. // Don't use is_int here. $char is a string. Use is_numeric instead. // Set all castling to false. Only set to true if letter is present in FEN. Prevents bugs. // ChessPiece throws its own exceptions, so no need to throw one here. // But we want to print them starting with row 8 first. // So we need to adjust the loops a bit. // Keeping this for debug reasons. // We need to throw some variables into an array so our view can build the board. // Note: This does not check for and reject illegal moves. It is up to code in the ChessGame class to generate a list of legal moves, then only make_move those moves. // In fact, sometimes make_move will be used on illegal moves (king in check moves), then the illegal moves will be deleted from the list of legal moves in a later step. // Update $moving_piece->square too to avoid errors. // Used to move the rook during castling. // Can't use make_move because it messes up color_to_move, halfmove, and fullmove. // Array of pairs. The list of both columns put together cannot contain duplicates. id ="<?php echo $column['id']; ?>"
Some of the class methods are really large - e.g. ChessGame ::get_legal_moves_list() which consumes ~150 lines. There is a lot of redundancy - especially in the code to assign $directions_list. That code should be moved out to a separate method. Generally whenever a method goes beyone ~10-15 lines you should consider refactoring it. In addition to readability it will also help with testing. In that method, there are 4 calls to ChessGame::add_slide_and_slidecapture_moves_to_moves_list() and those could all likely be simplified to a single call whenever the piece type is bishop, rook, queen or king. Because $directions_list doesn't appear to be used later in that method, perhaps it could be removed from the list of arguments for all methods that accept it, and those methods could fetch it when necessary. For more tips on cleaning up code, check out this video of a presentation Rafael Dohms talk about cleaning up code (or see the slides here). Ideally those would be handled - perhaps in Index.php with a try/catch that may set the value of an error variable and the view would display that error message instead of the board. Generally it is best to separate the business logic (PHP) from the view (HTML). Using a template engine could help for this aspect - e.g. Smarty, Twig, etc. For more information on this topic, prefer to this article. Did you consider using post for the form method? If the form was submitted as POST requests, then the form variables would not be in the query string, and the user might be less apt to modify them. The effect would be that on the server side $_POST would need to be used instead of $_GET. Some would argue that readability suffers here because on the first line, $time is a string, then on the second line it is an array and then on the third line it is a string again. And notice the next example is titled Example #2 Timing script execution in PHP 5, where it simply calls microtime() with true for the parameter get_as_float. So instead of using those first three lines of Index.php could simply be replaced with the call to microtime(true) for the same functionality. The same applies to the identical code within View.php. I like how the drag and drop code is effective and concise - typically such code ends up being overly-complex. And I often recommend DOM references (e.g. $('#make_move') be stored in a variable (or const if ecmascript-6 is used) but there are so few of them and most of the moves require a page-load that it likely wouldn't be worth it. As mentioned in the original question, my code is SLOW. It takes 1500ms to calculate approximately 30 moves. This is way too slow for this code to be used in a chess engine. Chess engines (A.I.) need to be able to calculate hundreds of thousands of moves or more per second. I installed WAMPP (Apache + PHP) on my computer, installed XDebug, loaded my chess game with the profiler on, then viewed the profiler log in QCacheGrind. This is NOT what I expected to be taking the majority of the calculation time. And it's easy to refactor the code to only calculate the FEN about 30 times (instead of the 6,775 times in the screenshot). 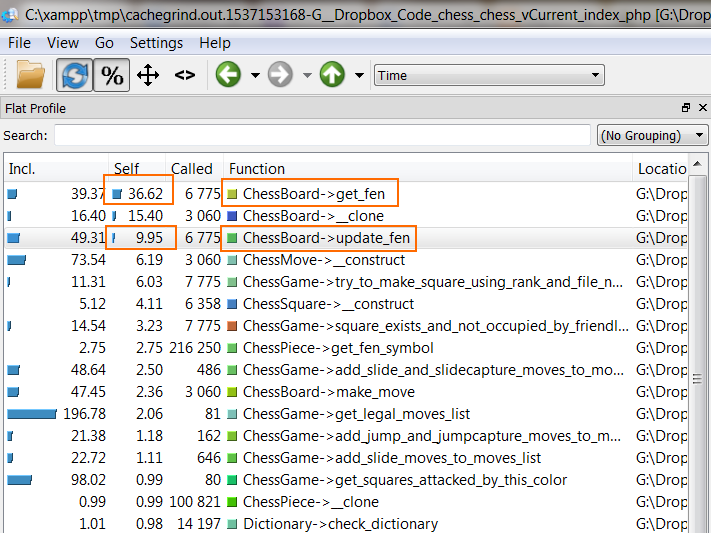 I deleted the ChessBoard->fen variable, then I deleted most of the calls to update_fen and get_fen. By not having to keep the ChessBoard->fen variable up to date every single time the ChessBoard's internal variables change, we save a lot of calculations. As you can see, this modification has made the code 2.6x faster. I kept tinkering with the code and realized that I do not need to place the entire ChessBoard in each move, if the move we are generating is a second layer move (just used to get threatened squares). I refactored the constructor of the ChessMove class and wrapped some of the $board stuff in a conditional. This shaved off 306 ms. Awesome! Use $haystack[needle] instead of array_search($needle, $haystack). Simplify square_exists_and_not_occupied_by_friendly_piece. I don't need to compare it to a giant array of legal squares. I just need to check that $rank and $file are >= 1 and <= 8. Move certain arrays to constants (mentioned in Sam Onela's answer), especially since they are currently inside of loops. Delete ChessMove->notation and ChessMove->coordinate_notation, and use a getter instead. That way we don't need to update them every time ChessMove's internal variables change. Delete Dictionary and use constants and array functions instead.